Today, Ireland only has remnants of its ancient forests and has one of the lowest levels of tree cover in Europe. While afforestation is promoted with plantations of conifers and native trees (tree cover across Ireland is around 12%) there is value in considering how ancient forests were once regarded. Ireland was deforested over many centuries; its great forests declined with successive invasions. There are important ideas recorded in medieval literature that at times captured pre-Christian Brehon laws, perhaps handed down from ancient Celtic oral cultures, about how trees were once valued and why their destruction was a serious, punishable offence. I have written previously about how Rights for Nature are being advanced today in legal spheres in some countries like Ecuador (codified in 2008) and Aotearoa New Zealand, along with ideas that ecocide, the destruction of ecosystems like forests, is a crime. It is, therefore, interesting to reflect that Ireland’s early system of laws, the earliest in Europe, set out to protect its trees so that human and nonhuman communities could be sustained. 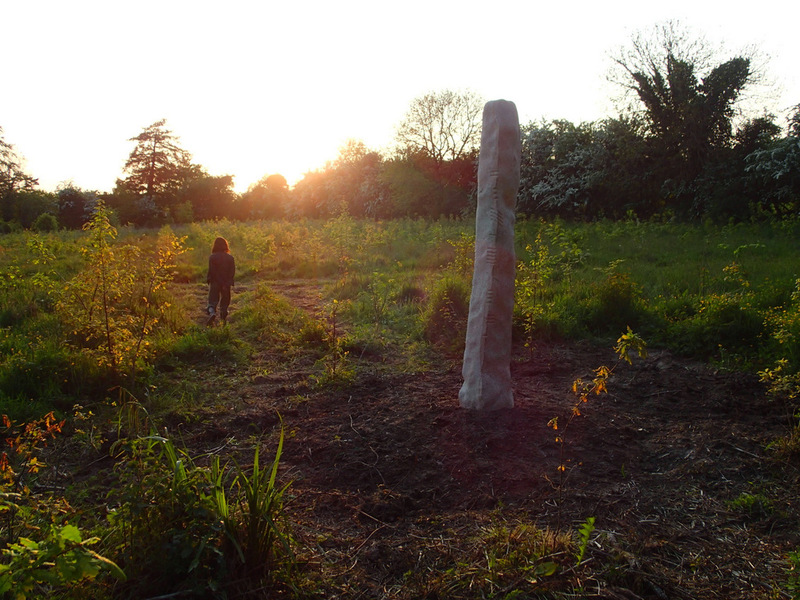 I’ve been thinking about this recently as my husband Martin was commissioned to sculpt an Ogham tree-teaching standing stone (see this link for Martin’s sculpting process) for Blackstairs EcoTrails who have developed an educational Celtic Tree experience walk and talk. Scholars speculate that the very basic Ogham symbols, carved 1500 years ago in standing stones across Ireland (around the 6th century AD) were perhaps influenced by oral Brehon, pre-Christian Celtic forest lore. Some consider that the simple Ogham symbols have long been associated with tree species as they resemble tree branches. In any case, over centuries each of the Ogham symbols became associated with individual Irish tree species. Blackstairs EcoTrails have also commissioned a 15-minute film about these Irish tree classifications and why Ireland’s trees were so important. Filmed in and around south County Carlow, the film then focusses on the noble trees, their new five acre oak and native tree species woodland and Martin’s tree-teaching standing stone at Blackstairs EcoTrails, Killedmond, Co. Carlow. Importantly, the film reflects on Ireland’s past forest culture that appears critical to re-visit for today’s environmental concerns. We’ve been lucky to meet the filmmakers and to see a sneak preview of the film – some of the drone shots from above south Co. Carlow are extraordinary to appreciate how beautiful this area is and there is reference to people we know who work with wood. While Carlow is not well known for its forest history, its great to see another creative project, along with Hollywood, that is helping cultivate critical reflection and new ideas for Ireland’s forests. Next year, also marks the first time that ProSilva Ireland will organise a forest visit in the county to develop further conversations on the necessity of continuous cover forestry. The Blackstairs EcoTrails Celtic Tree experience will be an ongoing feature walk for tourists and local people. It is part of the Ancient East promotion of the area by Ireland’s tourist board Bord Failte. For Heritage Week 2016 people can go on the Celtic Tree Experience, see the film, the young forest and Martin’s standing stone for free. Venue: The Old Rectory, Killedmond, Borris, Co. Carlow. Time: 3.00 to 4:30 pm. Beautiful, Catherine. So very informative, inspiring and well-written!